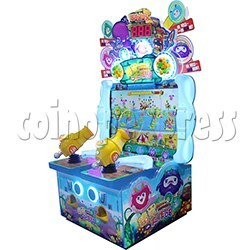 Bubble Monster Laser Gun Shooting Game machine is a popping bubbles ticket redemption game machine, plays with sea adventures game play, hitting a large number bubble monster over the colorful ocean, attracts with high definition video displays and two sides with eye-catching flashing lights decorated, features with two laser gun shooter with shooting buttons installed, features with simple game play, by controlling two guns to shot at the screen to hit bubble monster targets to get more scores for related tickets rewards. Players control a laser shooter and need to clear the colorful bubble monster balls before they smash down your playfield and end the game. Along the way you will also collect many scores, achievements to win much more tickets.